Ten years after graduating from high school in Neptune, California, Veronica Mars is back in the land of sun, sand, crime, and corruption. She’s traded in her law degree for her old private investigating license, struggling to keep Mars Investigations afloat on the scant cash earned by catching cheating spouses until she can score her first big case. Now it’s spring break, and college students descend on Neptune, transforming the beaches and boardwalks into a frenzied, week-long rave. When a girl disappears from a party, Veronica is called in to investigate. But this is no simple missing person’s case; the house the girl vanished from belongs to a man with serious criminal ties, and soon Veronica is plunged into a dangerous underworld of drugs and organized crime. And when a major break in the investigation has a shocking connection to Veronica’s past, the case hits closer to home than she ever imagined. 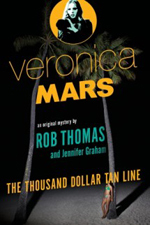 This is a book for Veronica Mars fans, to listen to after seeing the crowd-funded movie (I watched it last weekend and was not disappointed! While I’ve been watching Kristen Bell’s new show, House of Lies, I miss Veronica and her many mishaps). The story picks up a few months after the movie ends, and Veronica is still in Neptune when a college student disappears during the Spring Break season. Logan is missing for the entire story (for reasons the movie details) but another person from Veronica’s past shows up that I wasn’t expecting to see again. I hope in the future we see more new characters because I personally am getting a little weary of some of the same old people, but maybe I do not fully appreciate the importance of repetition in a girl detective narrative. 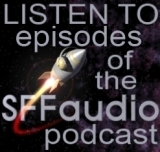 The audio is great fun because it is read by Veronica herself, Kristen Bell. Her voice carried us through the narration of the tv show and movie, and having anyone else read the book would have been a real tragedy. She does different voices for the characters, as well as distinguishing the narrative voice from the character of Veronica Mars. I hope they continue to have her read the future Veronica Mars audiobooks (and I hope there will be future Veronica Mars books).